Watch out, Alistair. you've got some competition! Unfortunately I didn't log into SWTOR beta this weekend like I had planned. I just ran out of time and before I knew it the weekend had flown by. Dire had a bit more time off than usual so I wanted to spend what I could with him.Though BioWare was close to my heart still, I spent most of my gaming time playing Dragon Age II. 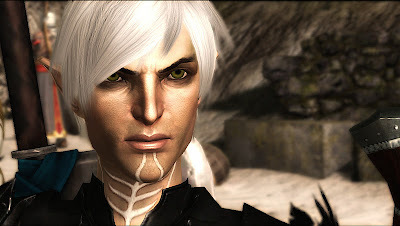 Dragon Age II really has stolen my heart, I put off playing it for quite awhile and since I've gotten Skyrim I thought I'd wait it out a bit longer, but watching Dire play made me miss the Dragon Age scene. I thoroughly loved the first and will probably give it another play through after I finish the second. The companions are so humorous, there are a few I like more than the others. My favorites would have to be Anders, Fenris and Varric. 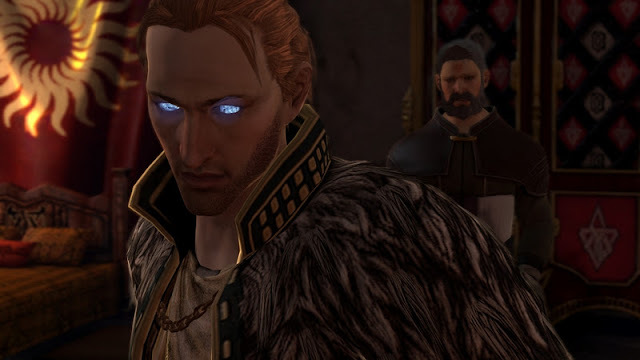 Varric is hilarious, jarring at first but he is a comical one, Anders has a soft spot in my heart and I didn't expect to be so drawn to Fenris, even if he does hate mages... Luckily I'm not a mage. The music has also struck a chord in my heart, it's just as enchanting as the first game. I suppose the companions make the game, for me at least. They bicker, they approve and disapprove, they seek your interaction and just make the game feel alive. I find myself laughing out loud listening to their dialogue. BioWare really has something special there with companions tied in with great stories and I look forward to TOR because of this. I also liked how this game has a much faster pace and the story seems to just flow. I really get into the game and it doesn't feel like slaying 1000 monsters, bad guys, whatever; to advance in the story. The combat was more fluid and I enjoy the fact that my companions are pretty competent at doing their job and... if they aren't, well, I can always take over for a moment. Shots taken by my son. I did manage to poke around in Skyrim a tiny bit, I really enjoy the game, as does my son who has since passed me up by many levels. I plan on working on this one more so this week. I want to advance through the story as I have been dilly dallying around exploring. One of our best friends started playing WoW again and started up a new rogue alt who is already 43 or so. It has been nice to see him on and we're wanting to get each other around the same levels to do some grouping on the horde side together. I also made another DK alt while I wait on them to catch up, maybe I'll tank a bit with it, who knows. I am wondering if 4.3 will come out this week, if not this maybe on the 6th. I hope sooner or later, we've been waiting forever it seems! 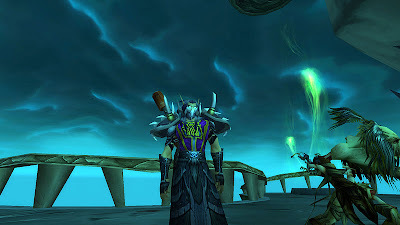 It would be nice if it came out this week, we could get in on this month's Darkmoon Faire. The revamped faire looks like a lot of fun. That's about it for me, have a great week!